The park is open every day of the year, 8:00 A.M. to sunset. See park bulletin boards for specific closing times. Contact the Neshaminy State Park office for facility seasons and hours. 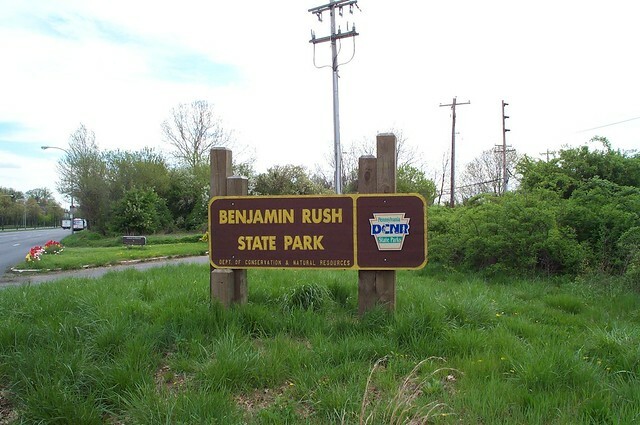 Benjamin Rush State Park is in Philadelphia County, Pennsylvania, 2 miles south of PA Turnpike Exit 351. From Exit 351, take US 1 (Lincoln Highway) south approximately 1.5 miles. Turn left onto Southampton Road. Turn left onto shared road for the Delaware Valley Veterans Home and the park. Park entrance is on the left. The park hosts one of the largest community gardens in the area. Gardeners may rent a plot in the community garden to grow their own flowers and vegetables. For more information about how to be involved, contact the Benjamin Rush Garden Association at 215-969-0507. Benjamin Rush State Park participates in a carry-in/carryout trash disposal program. There are no trash collection or recycling facilities. Visitors are asked to limit the amount of disposable items brought to the park and to take all trash, garbage, and recyclables home. Hunting is prohibited at Benjamin Rush State Park.